This page is still in the throes of construction. Please check back soon to find the latest news and events at Connections Plus Australia, download AGM reports and apply for any positions vacant. 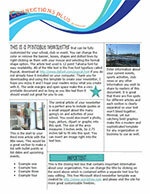 Please be patient while we prepare our latest Newsletters for you to download. Are you registered to receive our Newsletter? If not, sign up now! I confirm that I wish to join the Connections Plus Newsletter Mailing List and will enter the security code as I see it below to ensure I'm not a robot before clicking "Join". Connections Plus is always looking for dedicated people to join our team in providing care and support for children and adults with a disability, and their families. There are various roles and responsibilities, hours of employment and levels of training required. Contact us today if you are interested in a career as a carer. All successful applicants must have an Accredited Australian National Criminal History Check and obtain a Working with Children Check to commence delivering services. © 2018 Connections Plus Australia Inc.